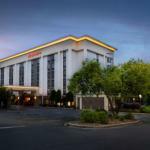 Free hot breakfast free Wi-Fi a seasonal outdoor pool and Riverbanks Zoo seven miles away make devotees of our guests at Hampton Inn Columbia I-26/Harbison Blvd. which offers free parking. The six-floor Hampton has 112 spacious rooms featuring comfy beds with pillowtop mattresses topped in crisp cotton-rich linens and comforters. Amenities include microwaves mini-fridges coffee/tea makers desks and handy lap desks for surfing the free Wi-Fi. Watch some premium cable on the flat-panel TV or plug in the iPod to the clock radio with mp3 jack. Help yourself to Southern hospitality at the free hot breakfast with a rotating menu of scrambled eggs hash browns biscuits and gravy and cold items. The hotel also has a laundry facility seasonal outdoor pool 24-hour fitness center and free parking. Borrow a hotel bicycle for a pleasant ride around nearby Harbison Lake. The hotel is in northwest Columbia right across I-26 from the Columbiana Centre mall. Located a half-mile north Frankie's Fun Park offers cool stuff for the kids. Riverbanks Zoo is seven miles and EdVenture is nine miles southeast of the hotel. The University is 10 miles southeast and the Five Points shopping dining and nightlife area is 11 miles southeast. If you're driving from Columbia Metropolitan Airport the hotel is 12.5 miles north.